Titled 'The Carriage Drive' this is the main walkway, up from the main entrance on Preston New Rd. 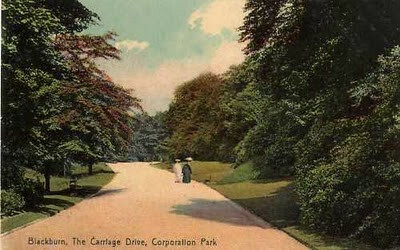 On the left hand side, not really visible in this image, is the Snig Brook, which runs down from the top of the park, filling both lakes, then falls down the embankment by the statue of Flora, under the walkway to the small fountain (The Dingle - See following posting) which is just out of sight in this view, then carries on down to the Garden of Remembrance, by the entrance to the park. From there the brook runs under Preston N. Rd, eventually winding its way down (underground) to meet the Blakewater in the Wensley Fold district.